Light Host Review 2019: Is Light Host a Good Hosting? With servers located in the Bezeq International server farm, Light Host is a great option for Israeli companies and individuals looking for a solid selection of VPS solutions or quick-and-easy hosting with their favorite CMS. Light Host is the web and server hosting arm of the internet services provider Advanced Internet Services Ltd. They are an Israeli web hosting company with their data center located in the Bezeq International server farm in Petah Tikva. They provide website design and development services in addition to hosting. All Light Host hosting products come with the Linux and cPanel combo that is still the most popular setup for website hosting. The Softaculous software that comes with cPanel allows you to install all the hosting software you need. You can opt to automatically install your choice of CMS such as WordPress, Joomla, Drupal, or Magento with their respective template stores. Light Host’s servers are configured to provide optimal performance when running these popular web hosting applications. Whichever CMS you choose, you will find that Light Host can help you with web design and development services. It’s hard to see what anyone can do with 50 MB or 75 MB of data, so you will soon find yourself hitting up against the low storage limits of Light Host’s lowest web hosting plans; unless you sign up for a more expensive plan, which could well be part of their plan in offering such low limits. From the 300 MB plan onwards, you get a domain included for free, and four of the top five plans come with a 30-day free trial. 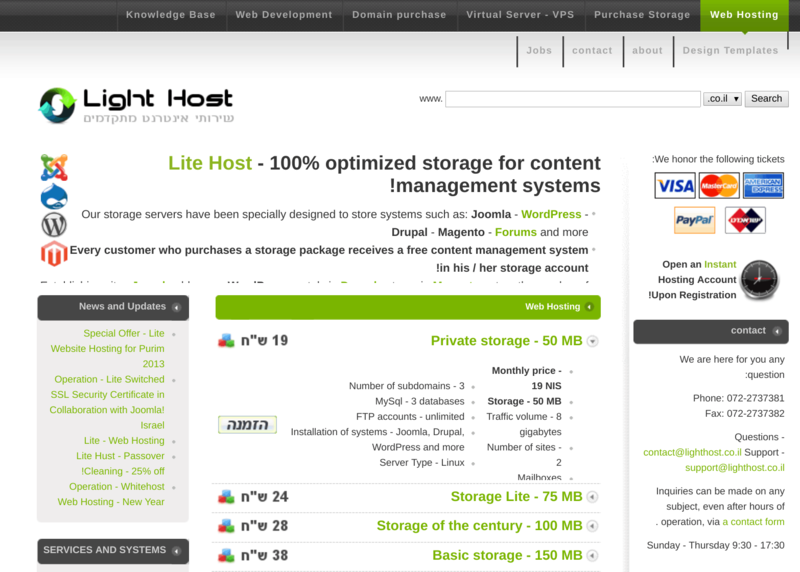 Light Host’s VPS products seem to provide much more reasonable resource limits for the price you pay. You can choose solutions with between 256 MB and 4 GB of dedicated memory, 10 GB to 100 GB of storage, and 1 to 4 vCPUs. Monthly to biennial billing is available for all plans, and you should also look out for their CMS-specific hosting options. Light Host’s only avenue for 24/7 technical customer support is a ticket/email system, although you can also phone them between the hours of 09:30 and 17:30 (Israel time) from Sunday to Thursday. Despite their limited availability, the support staff are technically top-notch. There is also a self-help database, but it’s not the most complete I’ve ever seen. By far the two biggest cons of using Light Host for your hosting needs are their extremely restrictive resource limitations on shared web hosting plans and their limited support. However, the automated CMS installation and website development services may well be attractive options for those who don’t have the time or experience to do it themselves. Wondering how Light Host stacks up against other Web Hosting companies? Enter any other Web Hosting company and we will give you a side-by-side comparison.